Many parts of Queensland have been declared disaster zones and thousands of residents evacuated due to a 1-in-100-year flood. Townsville is at the epicentre of the "unprecedented" monsoonal downpour that brought more than a year's worth of rain in just a few days, and the emergency is far from over with yet more torrential rain expected. For the first time in Australia, our research team has been monitoring the floods closely using a new technique involving European satellites, which allows us to "see" beneath the cloud cover and map developments on the ground. 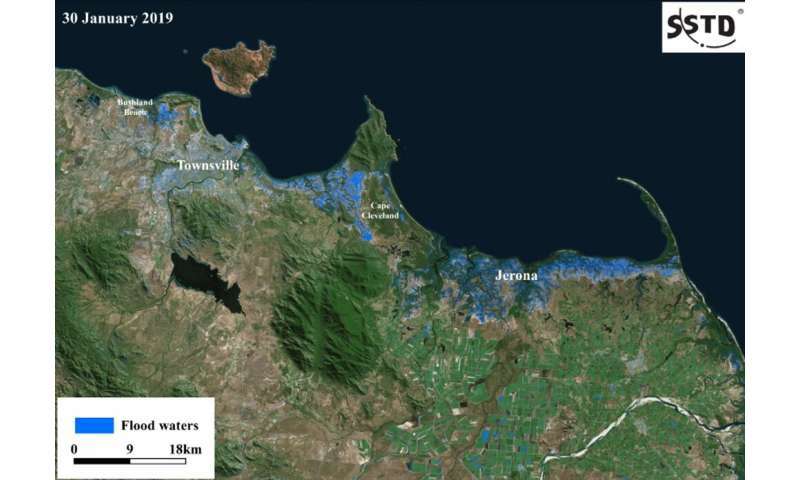 Given that the flooding currently covers a 700km stretch of coast from Cairns to Mackay, it would take days to piece together the big picture of the flood using airborne mapping. What's more, conventional optical imaging satellites are easily "blinded" by cloud cover. But a radar satellite can fly over the entire state in a matter ofseconds, and an accurate and comprehensive flood map can be produced in less than an hour. Our new method uses an imaging technology called "synthetic aperture radar" (SAR), which can observe the ground day or night, through cloud cover or smoke. By combining and comparing SAR images, we can determine the progress of an unfolding disaster such as a flood. In simple terms, if an area is not flooded on the first image but is inundated on the second image, the resulting discrepancy between the two images can help to reveal the flood's extent and identify the advancing flood front. To automate this process and make it more accurate, we use two pairs of images: a "pre-event pair" taken before the flood, and a "co-event pair" made up of one image before the flood, and another later image during the flooding.